We have been picking figs this summer since July 7. The tree has —so far— yielded about 70 pounds of figs! Freezing is a great way to have figs all year. 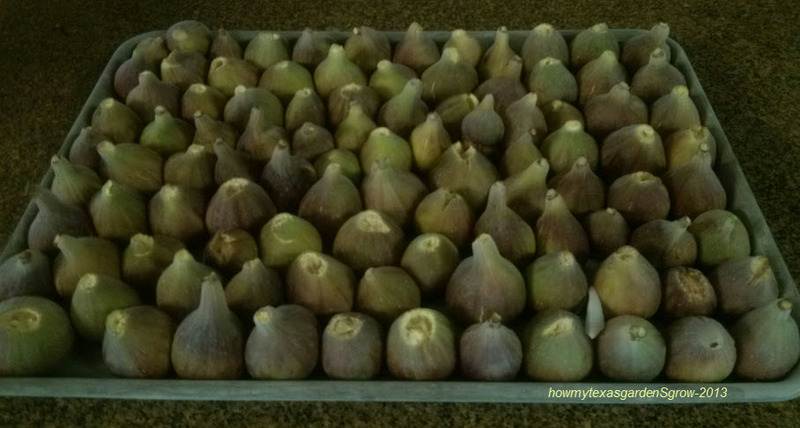 (We finished the last of the frozen figs from summer 2012 two weeks before we picked the first summer 2013 fig!). Steps to freeze—- 1) rinse well with water (these are organically grown, no pesticides), 2) place on cookie sheet (see picture), 3) freeze at least 3 hours (I have left them on the cookie sheet overnight), and 4) put into bags for storage. NOTE—we use vacuum-packed and sealed gallon bags, then open them and use a clip to keep the bag closed. Because the figs are frozen before packing, they will break apart easily and you can remove as many or as few as desired. Rinse the frozen figs in a cup of warm water to soften them and they will have the texture of a Popsicle — a great treat for the hot summer months!